On Friday the 17th Instant at Morris Town in East New Jersey, was executed, David Reynolds, a Native of Ireland, about 32 years of age, for counterfeiting the money Bills of Credit of that Colony. He arrived there about ten Years ago, and chiefly followed the farming business, till getting acquainted with one Rosecrans (executed some time ago for the like Crime, but without declaring his Accomplices) he was by him led into the Scheme of making and passing counterfeit Money; after the Execution of Rosecrans, Reynolds accidentally met with Capt. Richardson (of Philadelphia, who is fled) and getting acquainted with each other’s Characters, was by him introduced to Ford, Haynes, Cooper, Budd, King, and the rest of the Gang. Ford the Principal, termed by the Rest, the Treasurer of the three Provinces, had counterfeited the Money Bills of New York, New-Jersey, and Pennsylvania, in so Masterly a manner as not to be distinguished from the true Bills without the nicest Inspection, and also several of the Gold and Silver Coins current in the British Colonies: and in passing these, Reynolds and the Rest of the Accomplices continued, till Ford and King were apprehended and imprisoned in Morris County Gaol, from whence they soon made their escape, as mentioned in the Papers. 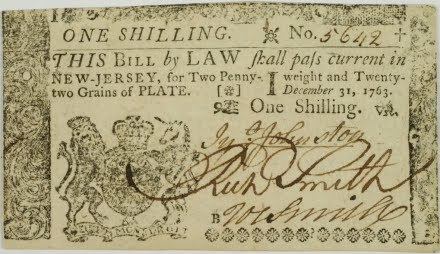 Paper currency of colonial New Jersey. One of the Gang being convicted of aiding them in their Escape and other high Misdemeanors, to mitigate the Punishment, made some Confessions tending to the Discovery of the Rest, which alarmed another, who made an ample confession of the whole, in Consequence of which Reynolds, Haynes, Cooper, and Budd, were tried, confessed their Guilt, and were condemned to be hanged. Their Execution was ordered to be on the 17th Instant; before that Time, Budd and Haynes were respited for a Month, but Reynolds and Cooper were ordered to prepare for Execution at the Time appointed. A few Minutes before the Time, Cooper confessed himself privy to the Robbery of the Treasury at Amboy, and that he received Three Hundred Pounds of the Money; on which he was also respited till he should make further Discoveries. Reynolds was therefore ordered for Execution alone, at which he seemed much affected and burst into Tears, but thro’ the Assistance of a Minister who attended him, he grew Calm, and resigned to his Fate. His Behaviour during his Confinement and after his Sentence, was penitent and submissive; he shewed a proper Sensibility of his unhappy Situation, and earnestly exhorted his Companions in Guilt, to a sincere Repentance. On the fatal Day, he took an affecting Leave of them; and they all discovered the most lively Expressions of that Distress to which their Crimes and Follies had reduced them, which drew Tears from the Eyes of the Spectators. At the Place of Execution, Reynolds sung and prayed very earnestly, and in a short but pathetic Speech, warned the People to avoid the Vices that had undone him, and earnestly requested them not to reflect on his innocent Wife and helpless Infants. All the other three reprieved ultimately escaped hanging, owing to influential connections. Interesting; for some reason, I’ve always thought the word ‘gang’ was a 19th-century invention.